SSL Format C multi-memory Combination Action, 8 levels of memory. 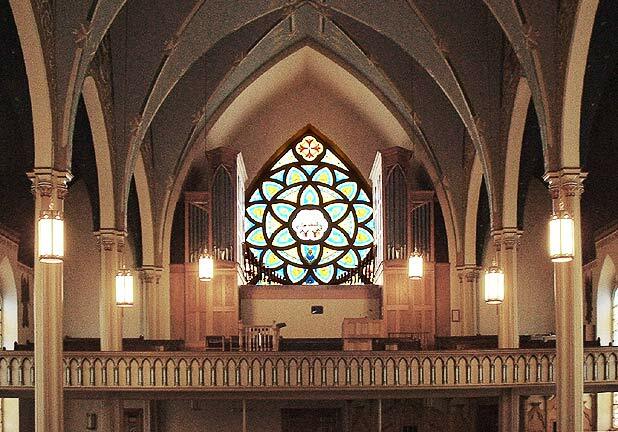 During the early 1980s, Immaculate Heart of Mary Church, Rutland, Vermont, began planning a major restoration and renovation of their facility, a grand Victorian Gothic building originally dedicated in 1894 and later renovated in 1940. The building, blessed with superb acoustics, approaching 6 seconds of reverberation time on a humid summer day, was to be restored, with a few important improvements. Under the direction of Pastor Richard Tinney with input from organist Robert McMahon and the Restoration Committee, the architectural firm of Joseph Collura Associates, Saratoga Springs, NY was selected to for design and oversight of the project. The goals of the project were to create a viable worship and community space for the church as it prepared to enter the twenty-first century. The more important aspects of the project included: excavation of under the church to create a new parish hall, restroom facilities and kitchen; restoration of the original painted interior and stained glass; modification and enlargement of the chancel area and replacement of the worn hardwood flooring with ceramic tile. 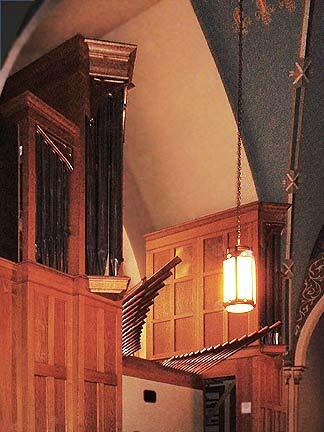 The organ, a 15 rank tubular pneumatic Estey organ (5-8-2) installed in 1922, which had been electrified and rebuilt by Edward F. Collins of Troy, NY at mid century was also to be replaced. Initial design requirements for the instrument called for a free standing, mechanical action instrument to be located in the chancel. Logistically, this location proved unworkable and the decision was made to maintain the gallery location for the organ and choir. It was also becoming apparent that funds for the organ would be also be severely limited due to the escalating cost of other aspects of the renovation project. Careful inspection of the existing instrument revealed that several ranks of pipes could be rebuilt and incorporated into the new organ as a means of saving cost. Additional cost savings were realized by a switch to electro-mechanical action and a redesign of the instrument so that it could be completed in stages over a period of several years. The initial contract for the instrument was signed on October 21, 1991. It provided for the basic instrument to be installed in the gallery on scaffolding, without casework, but with ample room to complete the tonal scheme. The new console was specially designed so that it could be easily modified to add a third manual for either a Positiv or Choir division at some future time. Despite the financial limitation, only premium quality components were used in the construction of the console and wind-chest mechanisms to insure a long and trouble-free life. After the installation began in late 1993 additional funds were found to provide for the construction of the casework. The new casework and tonal finishing were completed at the end of January 1994, with the dedication concert presented by Harriette Slack Richardson on Sunday April 24, 1994. 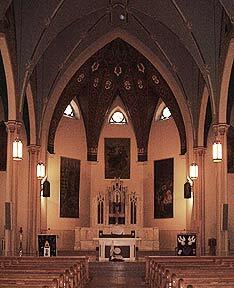 A Dedication Mass was held on July 9, 1994 to celebrate the completion of the renovation project. The instrument performed well, in its limited capacity, now under the hands of organist, Richard Brown, but the organ had only one reed, the Hautbois, the Great was deficient in 8’ stops and the Pedal had only one independent rank. In 1999, thanks to generosity of parishioners, sufficient funds were received to complete the original scheme and add to the original design. Work was completed in October 2001 as Opus 25A, with a rededication concert given by organist Richard Brown on April 5, 2002. 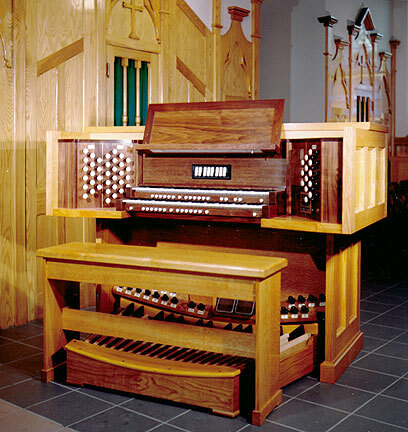 Tonally, the instrument is conceived in late 20th century “American Classic” style with a stop-list capable of meeting the numerous liturgical, accompanimental and performance requirements demanded of it. Special care was taken with custom scaling and voicing to create a warm, singing tone dominated by the 8’ line. 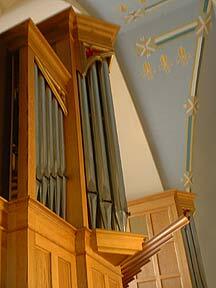 Pipe-work was voiced to maximize the unforced beauty of tone at each pipe. The treatment of the mutations and upper-work is such that these stops add clarity to the ensemble without being strident. The superb acoustics of the church work with the elegant voicing to create a truly outstanding instrument for the 21st century.